If you'd like to find a Northern California home on a golf course, The Villages Golf and Country Club might be for you. Golf is enjoyed by many active adults, so it’s no surprise that an on-site golf course is one of the most desired amenities at 55+ communities. In response to the needs of active adults, many retirement communities now offer beautifully landscaped courses, in addition to a fantastic lineup of other amenities. We’re exploring the top four age-restricted communities in Northern California where residents can enjoy on-site golf. Sun City developments are well known for their abundant amenities, and Sun City Lincoln Hills certainly lives up to this reputation. This 55+ community consists of 6,783 single-family-homes and attached homes. Sun City Lincoln Hills is home to the Lincoln Hills Golf Club, which has two 18-hole golf courses: the Hills Course and the Orchard Course. These golf courses were designed by Billy Casper and Greg Nash, so they offer both aesthetic appeal and a challenging game for different skill levels. While the Lincoln Hills Golf Club is located within the Sun City Lincoln Hills community, membership is separate, however, residents have access to reduced rates. In addition to the on-site golf course, residents of Sun City Lincoln Hills enjoy access to a large sports complex, pools, spas, restaurants, and more. Rossmoor has remained a top choice for active adults seeking a golf course community in Northern California. This award-winning 55+ community is home to well over 6,000 residences, consisting of condos, single family homes, and attached homes. 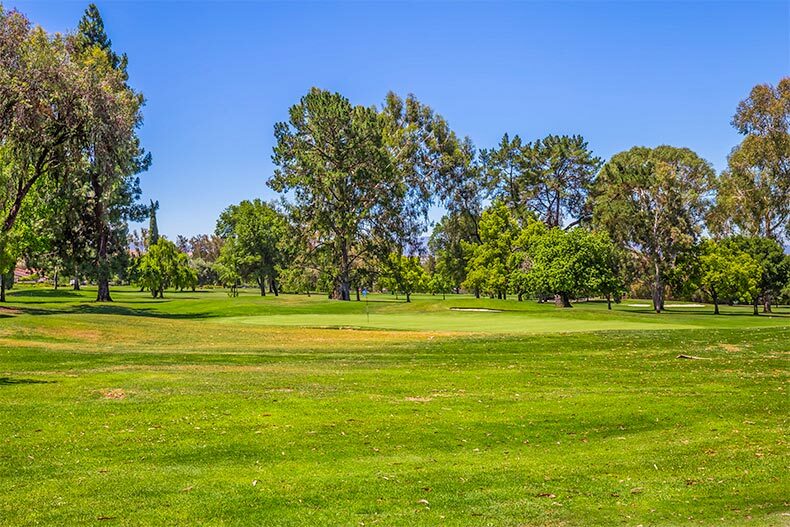 One of the biggest draws of Rossmoor is the fact that it offers 27 holes of NCGA-rated golf. The 18-hole Dollar Ranch course was designed by renowned golf course architect Robert Muir Graves. For golf players interested in a shorter game, Rossmoor also has a popular 9-hole course called Creekside. Both of these beautifully designed courses meander through mature landscaping and trees. Rossmoor’s golf amenities also include practice facilities, a pro shop, and a full-service restaurant and bar. Residents are also served by five on-site clubhouses with additional amenities, including swimming pools, tennis courts, a fitness center, scenic natural spaces, and miles of walking trails. Trilogy at Rio Vista blends resort-like amenities with a quaint, tranquil setting. Ideally situated in between San Francisco and Sacramento, this gated 55+ community offers an exceptional lifestyle with moderately priced homes. Development is still ongoing, but upon completion, there will be 3,000 single family homes. Designed by golf course architect, Ted Robinson, Sr., this 18-hole golf course offers up an exciting game. It incorporates water features and a unique layout to challenge golfers of any skill level. The course also showcases the natural beauty of the surrounding Sacramento River Delta area and the community’s well-maintained grounds. Residents of Trilogy at Rio Vista have a full lineup of amenities to stay busy when they’re not on the golf course. The community’s two clubhouses feature fitness centers, pools, a ballroom, tennis courts, a center for learning, and more. The Villages Golf & Country Club is a private escape nestled in a natural setting, but it’s only about 10 minutes away from Downtown San Jose. This gated 55+ community is home to 2,536 residences, consisting of condos, single-family homes, and attached homes. The on-site golf facilities allow residents to enjoy a little friendly competition with their neighbors. Designed by Robert Muir Graves, the championship 18-hole golf course attracts golfers from all over Northern California, not just those who live in the community. This popular course accommodates different skill levels and is set among lush landscaping. There is also a 9-hole, par-3 course for those wanting to improve their game. Off the course, residents can enjoy plentiful amenities at the community’s four clubhouses. These clubhouses offer fitness centers, pools, spas, a restaurant and bistro, and more.